I always enjoy checking out churches and listening to other preachers when I travel. In the late 90s, when I was working on a doctorate, I spent long periods of time taking classes at San Francisco Theological Seminary. Being absent from the pulpit for six weeks or so allowed me an opportunity to worship in many different settings. One of the churches I attended was Glide Memorial United Methodist Church. It’s located on the edge of the Tenderloin, in the Mission District, one of the seediest sections of the City by the Bay. It’s an older church built out of heavy stones and bricks. I assume it was built right after the great earthquake and fire in 1906, as much of that part of town was devastated. Cecil Williams, an African-American, had been their pastor since the early-60s. He was getting near retirement. He would retire in 2000. Several of us knew it might be our only chance to hear him, so we carpooled together and drove over. We’d been warned to expect crowds and advised to park in a parking deck several blocks away and to walk to the church. This we did. As we got to the church, we were surprised to see a long line of worshippers waiting to get in. They had three services on Sunday morning, all were packed, and those lined up on the sidewalk to get in were waiting for one service to end. We saw that the church had valet parking. Here in this seedy part of the city, young men, mostly African-American, in white gloves were taking the keys of church attendees, many of whom were driving BMWs and Mercedes’, and parking them in adjacent lots. When the church was cleared from the previous service, they packed us in. I guess this church sat seven or eight hundred people and that there were a few hundred more than that in attendance. As I said, it was an older building, constructed with thick walls so that each stained glass window had about a three foot bench in front of it. In each of the widows, they’d be two or three kids sitting and swinging their feet as if they knew they were at home. The place was packed. As I looked around, I thought that this wasn’t like any other church I’d ever attended. There were men in suits and women in nice dresses with matching hats and gloves sitting beside folks who were obviously homeless and hadn’t taken a bath in a week. There were women who appeared to be working the street, there were people who looked like they’d been burned out by drugs in the 60s and were barely hanging on. There were men and women who were obviously gay. And they were sitting by others who appeared to be high priced attorneys or managers within the financial community. Some people were wearing their best, others dressed casually, as if they were headed for a picnic on the beach, and others were dressed as if they’d spent the night behind a dumpster. Some probably had. In addition to the great collection of folks from all stratus of society, all races were present. Red, yellow, black and white, as the song goes, they were all there. Worship was lively, with a choir of probably a 100, including many of San Francisco’s finest musicians. There were plenty of “Amens.” There was lots of noise and movement. It was hot inside the building, but no one seemed to mind, everyone seemed to enjoy themselves. Being seen as perfect, good or respectable is not my concern. My concern is to create an open and honest community where it is safe to tell the truth. That is what people of all races and classes want today. Whether they’re executives or homeless people, all people want to know, ‘Who will care about me? Who will care for me? That question still rings true, nearly two decades later. This diverse crowd singing and praising God and having fun, seemed to be a glimpse of what heaven is to be all about. Of course, if we were to reach out in such a fashion on Skidaway Island, we’d never have the rainbow of colors found in Glide Memorial. But what would we look like if we were able to reach out into Chatham County, bring people of different races, economic levels, and backgrounds into our fellowship? Bringing in new faces will change us, yet isn’t that what Jesus calls us to do, to reach out to others? To care for one another? To accept everyone as a sinner loved by Jesus? John, the author of Revelation, is given this vision of a multitude too large to count. They’re from every nation and tribe. All peoples and languages are represented. They wave palm branches and cry out, “Salvation belongs to our God who is seated on the throne.” Joining these in their worship are all the angels and elders and these four winged creatures who fall on their faces as they sing praises. When John asks from where these people come, he’s told that they’ve all come through the great tribulation and now live with God in a paradise setting with climate control (there’s no scorching heat), filling food and refreshing drinks (there’s no hunger or thirst), and eternal comfort (God himself wipes away tears). The tribulation experienced on earth in the sixth chapter of this book is answered in the 7th. There is a reward for those who endure and this heavenly church is going to be unlike anything we’ve seen on earth. If one of our purposes as a church is to exhibit God’s kingdom, what can we learn from this passage? First of all, we’re reminded that the church is made up of all people and that not everyone at God’s throne will look like us. If that was the case, heaven would be boring. And probably most of us, with European backgrounds, wouldn’t be there. Paul could have stopped his preaching in Asia Minor. But you see, Jesus came to break that mold which taught that God was just interested in one group of people. In the life of Jesus we see that although he reached out to everyone, he was especially concerned for those who were neglected and sidelined. If we want to truly exhibit the kingdom as well as live up to our vision statement to reflect the face of Jesus, we have to be welcoming of everyone. We have to reach out to all ages as well as find ways to serve those in need, including those who might feel uncomfortable around us or we might feel uncomfortable around them. This vision of John’s is what we’re to shoot for—a church encompassing all of God’s children. A second vision we have of that kingdom is of God taking care of the needs of his people. Here on earth, we are God’s hands and feet and we demonstrate God’s kingdom when we help others. Whether it is providing food or money for local shelters, Christmas gifts for those who go without, or a comforting presence for someone in grief. We do all this in Jesus’ name because that’s what he wants us to do. Now let me turn this around to you. How can you help make this place a community that demonstrates God’s kingdom? How can you help bring a more Christ-like attitude to our fellowship? What role can you play that will further our vision of being a church for all ages? This isn’t something I can do; it’s something that requires all our efforts. If you are committed to Jesus Christ and to this fellowship he’s called you to action. Think about this for a moment. It might be going out of your way to greet visitors. If you are healthy, one simple thing might be parking on the far side of our lot in order to free up closer spaces for those who are new to our church as well as those who have physical limitations. It might be inviting someone who has lost a loved one over the past year to attend service with you, or reaching out to a new family in your neighborhood and inviting them to be your guest at a church service or a meal at our church. We have a picnic coming up next month. It would be a nice and informal opportunity to bring in a new neighbor and introduce them to our community. Or maybe we’re called to the ministry of reconciliation. It’s our role to build bridges with those who used to be friends but for some reason the friendship ties have been broken. And then, what about us corporately? Many of you are involved in making this community a better place, but what can our church do other than give money? Is there a way we can become more involved, making a difference in Savannah? Talk to one another and share your ideas with the elders. 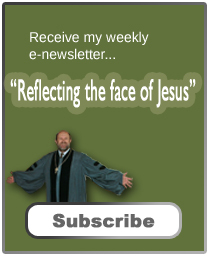 What will we do to “reflect the face of Jesus?” Amen. Paul says he becomes all things to all people so some might be saved. 1 Corinthians 9:22.